If you have done any live sound, you know that the floor and stage can become a huge rat’s nest of cables just waiting for someone to trip on one, and it can certainly look untidy and unprofessional. This is where a stage snake comes in handy. Why run six 30-foot XLR cables from the board to the stage if you only have to run one? Today we are looking at one solution, the Hosa LITTLE BRO’ (why does this have to be all caps?) SH 6x2 30 sub-snake. My first snake was a 100-foot Hosa, and getting it was a real lifesaver for me, so I have a soft spot for the brand. I could finally run sound further away from the stage so I could actually hear what was going on, and it made set-up and teardown a lot easier. It has been in my one of my flight cases for around 10 years, and have never had a single problem with it. The LITTLE BRO is a slightly different animal, as it is a lot shorter and does not have as many inputs, but that is where its magic is. I do not always want to lug around a 25-pound snake with twice as much cable as I need, so for smaller gigs this thing is awesome. 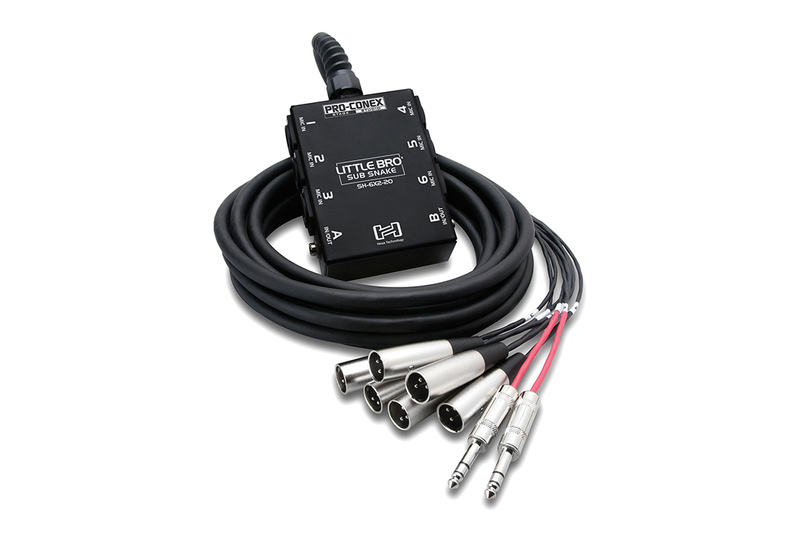 It does not have a ton of channels, with only six XLR sends and two ¼-inch multipurpose ports. But this is certainly enough to run a bar gig with a couple of monitors or powered speakers, though. But even better this thing makes a really cool drum riser snake, so that six drums can be mic’d with returns for monitors or headphones. The junction block on the business end is well laid out, with the connectors on the sides of the unit instead of on the top. This puts less stress on the mic connectors and makes them less likely to be tripped on by impaired musicians or audience members. Each port is also well-marked so it is easier to match up with what is going on at the mixer end. There is no noise added to the signals, and I have no complaints about its performance. If I had one wish it would be for locking connectors, but for the price I am willing to accept this thing jst the way it is. And the price is definitely a plus for the Hosa LITTLE BRO’ SH 6x2 30 sub-snake. This assembly has a list price of $136.50 and a street price of $89.90 – try to buy six quality 30-foot XLR cables and two TRS cables for that price (with a lifetime warranty, no less), and you will definitely come up short. Trust me, this is a great product and a great deal!